A journalist named Brea and her boyfriend John head up to the mountains for a romantic weekend to celebrate her birthday. En route, Brea encounters a troubled woman in a gas station bathroom who slips a cell phone into her bag when she wasn't looking. When it turns out this cell phone contains mountains of evidence of a human trafficking ring, it puts Brea and everyone around her in danger when the phone's owner comes looking for it. "Traffik" is to human trafficking as what "On Deadly Ground" is to rampant corporate pollution and exploitation of indigenous people. They both have a message, and that message is delivered in a rather clumsy and ineffective way. This film is written and directed by Deon Taylor, who is known for directing films like "Chain Letter," "Supremacy," and "Meet the Blacks." The story is about a journalist named Brea (Paula Patton), who is about to spend a romantic weekend at a remote vacation home with her boyfriend John (Omar Epps), who is minutes away from proposing to her. On their way to the house, Brea has an awkward encounter with a troubled, haunting looking woman at a gas station. This woman has secretly slipped a phone into her purse. Meanwhile, at the same gas station, John has a conflict outside with some unsavory looking characters who are all there with the woman Brea met inside. When the couple reaches their destination, they discover the phone in Brea's bag and learn that it contains photographic and video evidence of a human trafficking ring that operates in the area. When the owners of the phone show up looking for their property with guns in hand, it puts Brea and everyone around her in jeopardy. 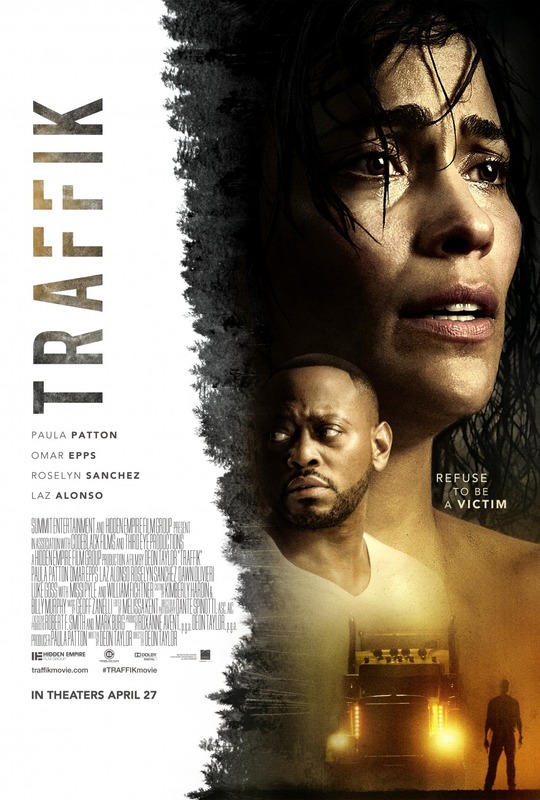 We missed "Traffik" when it came out in the theater, so we decided to Redbox it since we were interested and just didn't have the time to see it a few months ago. This film is a rough mix of scenes and dialogue that are downright terrible and cringeworthy and some genuinely tension-filled, exciting moments. The good part of this movie is any time the main characters of the story share a screen with the antagonists. Director Deon Taylor does a great job building suspense and making it feel like the protagonists are in real danger. In many thrillers like this, we run into a cliche where villains make demands and threaten death to characters, but never follow through on those threats. This happens time and time again in movies like "Breaking In" and even more action-oriented films like "Mechanic: Resurrection." This trope is a huge pet peeve of ours, and we are glad to say that doesn't happen here. Not even close. When the villain says they are going to kill someone if their demands aren't met, they sure as hell follows through in graphic form. This helped add a little more tension to the story. That being said, everything outside these of these action-filled moments like the dramatic story-building, is absolutely terrible. The acting couldn't be stiffer. The dialogue couldn't be more cheesy if it tried. The drama is a soap-opera-esque. We go from rolling our eyes and shaking our heads at its awfulness to getting excited and being very entertained whenever the tension starts to ramp up. There are also some very odd directorial and cinematographic choices in the way things shots are framed and in the way scenes transition. 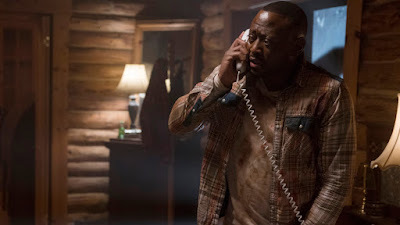 We're sort of glad we didn't see "Traffik" on the big screen because we feel like we would have picked it apart even more if we had seen it on a larger canvas. It is a very sloppily put together film. That being said, the majority of the movie thrives on its exciting moments so we can tolerate the bad parts since the gripping stuff is pretty damn entertaining.